Compatible with BOTH iphone 6 and iPhone 6s. Not compatible with 30-pin to Lightning Adapters or the majority of non-Apple branded USB to Lightning cables. FRÄ: Built-in scratch protector is virtually invisible to the eye and touch; full access to buttons and controls – charge and sync through the micro USB port; profile: slim, sleek design follows your phone’s precision lines. Water and Snow Proof: Fully submergible to 6.6’/2 m for 1 hour; Sealed from snow, ice, dirt & dust particles – meets or exceeds IP-68 Ingress Protection Rating. Set out with LifeProof FRÄ for Apple iPhone 6/6s and live with no limits. Waterproof and drop proof, FRÄ for iPhone 6/6s has the guts to go into the thick of it and come out unscathed. Featuring a built-in screen protector, FRÄ shields your iPhone 6/6s from Mother Natureâs worst. From ocean shores and mountain trails to desert dunes â no environment is too extreme for LifeProof FRÄ. So there I was having a bonfire with my family and burning a lot of brush and tember we’ve been clearing. My little girl decided to use my flashlight and I decided to use my phone as a light. I had my hands full of sticks and my phone for the light and as I went to the the sticks into the fire (mind you I know it sounds silly now) I managed to drop my phone into the got red coals. My phone sat there for a solid 10 seconds before I could flick it out with a stick. Well the life proof case did its job and protected my phone. Emailed the company and they sent me a brand new case no questions asked! Hell yeah 5 star product. I bought it for doing pictures and videos with my iPhone 6 while snorkeling on vacation. I performed the 30 minute test in the sink putting some dishes on top to keep at the bottom and it went fine. I could keep it casually in my shorts’ pocket while walking waist deep in water and feel safe against theft concerns at the beach. Does as advertised, but I wish there was a small compartment for storing my ID and some cash though. Very happy, will use it for skiing as well. It handles seawater without issues. Just like without it, touching the screen when underwater does no reaction, my advice is to “prepare” the iPhone by launching the Camera app first above water, and then only go underwater, whereafter the volume buttons do the actual photo shots. Then, to easily access my phone while in water, I go to the surface, wait for water to drool away (shake if necessary), and press the AssistiveTouch button, select my “Swipe” gesture, which shows a dark circle, tap that and it unlocks. Then I tap my Camera app and tap the “VIDEO” word to switch mode (no need to actually swipe). Then again go underwater because the volume buttons start/stop the videos. I’ve have two of these cases now and the customer service of Lifeproof is unbeatable. My first case(an older version) had the thumb pad come off, thus loosing it’s water tightness. I emailed them about it and two days later I had a brand new case(and updated version no less) for the $4.99 shipping charge, no questions asked. About a month ago I was snowmobiling in the hills and lost my phone while digging out a truck that had gotten stuck in a snowbank with a creek running below it. My phone was dropped right in front of the truck and undoubtedly got run over several times in the process of getting the truck out. I searched in vain for my phone for about 30 minutes to no avail. I just received a phone call that someone had found my phone and tracked me down using the iTunes account on the phone. The case was found about 50 yards down stream from where I lost it with a few dings in it but working flawlessly. The case stood up to being run over, being buried in snow, subjected to sub-freezing conditions, and being washed downstream. My iPhone still works exactly like it did the day I lost it and when I turned it on even the song I was listening too at the time was paused, ironically the song was “snow blind” by Black Sabbath. Needless to say Lifeproof as gained a customer for life. Last month I dropped my iPhone 6 in a puddle. I had the phone in a basic silicone rubber case (to protect against drops), but that case didn’t protect it at all from water damage. I tried the rice trick for 3 days, to no avail. So I ended up taking the phone in to an Apple Store. They were also unable to revive my phone, so ended up giving me a new phone as part of their $300 repair service. After being without my phone for a week, plus being $300 lighter in the wallet, I vowed to protect my phone better. After doing lots of research, all roads led to the LifeProof Fre case, so I ordered it from Amazon. 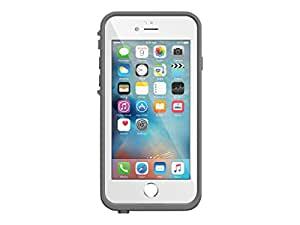 I had seen other people with LifeProof and OtterBox cases that seemed huge and clunky, and I was expecting that my new LifeProof Fre Case for iPhone 6 would be huge and clunky, too. I had also read that some LifeProof case users had difficulty using the fingerprint reader, or swiping up from the bottom of the display, or had other touch-related problems. But I had also read that it is critical to follow the installation instructions closely, including removing any screen protectors from the phone’s display. When the case arrived, I was positively surprised by the thinness, and by how attractive it looked. But instead of slapping it on, I took my time, following the installation instructions video on the LifeProof website. First I did a 30 minute underwater test with the case itself to ensure that there were no leaks in my case. After successfully completing that test, I cleaned my new iPhone 6 thoroughly to be sure there was no dust or fingerprints on the display or fingerprint button. Then I installed the case. When I started using my phone, everything worked great — the fingerprint reader, swiping up on the display, all touchscreen actions! The case exceeded my expectations. I’ve read that the original version of the LifeProof Fre case for iPhone 6 had some problems in terms of touchscreen & fingerprint usability, but that LifeProof made some revisions. I must have the 2nd-generation/revised version of this case, because it works perfectly. Although I gave the case 5 stars, and find a lot to like in this case, it isn’t perfect. First, the opening for the Lightning charger port at the bottom of the case it very small. We have cables from Apple, Anker, and Duracell in our home, and only the Apple-branded Lightning cables fit in the LifeProof case. If LifeProof were to make the opening even a tiny bit larger, it would make a huge difference for being able to use 3rd party cables. Second, the headphone jack screw cover is not easy to unscrew, making it inconvenient to listen to music. I totally understand the need to seal this opening from water damage, but I wish LifeProof would make the cover easy to take on and off, since I listen to music a lot. Third, the left side toggle switch (to mute/un-mute alerts) is a bit tricky to use. The other side buttons (left side up/down volume keys and right side power key) work just fine, however.